Text: The leaves we have seen indicate that this Book of Hours accords with the Use of Metz; see especially Leaf 28 in the Kent State, Denison, Kenyon, and Lima portfolios for evidence. 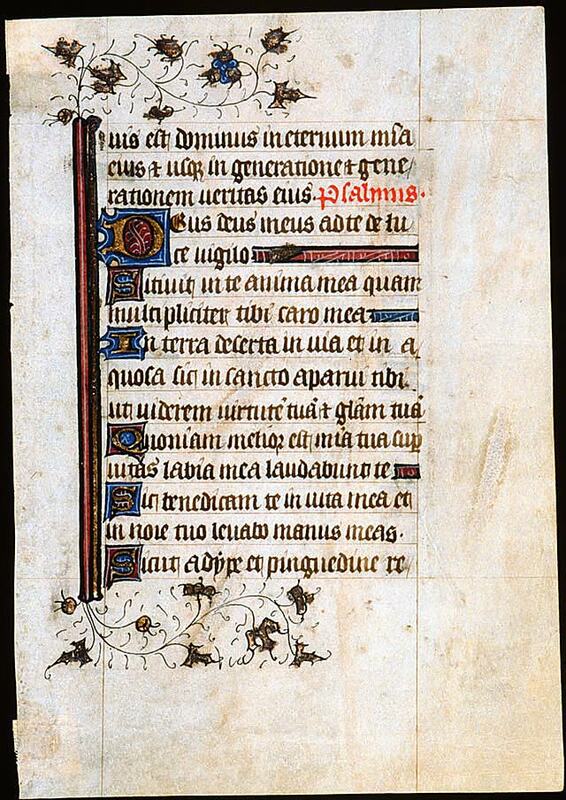 This leaf contains text from the Hours of the Virgin at Lauds, including Psalms 99 and 62. A scan of the verso is currently unavailable. -uis est dominus in eternum mia. eius et usque in generatione et generationem veritas eius. Psalmus. Deus Deus meus: ad te de luce vigilo. Sitivit in te anima mea: quam multipliciter tibi caro mea. In terra deserta, invia, et inaquosa, sic in sancto apparui tibi: ut viderem virtutem tuam, et gloriam tuam. Quoniam melior est misericordia tua super vitas: labia mea laudabunt te. Sic benedicam te in vita mea: et in nomine tuo levabo manus meas. [Psalms 99] ...and his truth even unto generation, and generation.